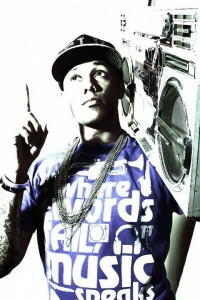 When Cross Rhythms named the album it considered the best hip-hop release of 2012 some Christian rap devotees might have been surprised that it wasn't by Lecrae, Trip Lee or any of the other big names in holy hip-hop, but rather a new and upcoming west coast emcee, Young Chozen. The 'Class President' album is packed with inventive delights with the Cross Rhythms reviewer enthusing that the album is "a banging fresh mix with the rapper bringing a tight flow which glides effortlessly across the project, mixing old skool '80s type 808 beats ("Drive Through" with a humorous, almost KJ-52 vibe), more rocky beats ("Backyard" and the epic "The Rock"), and much more. . ." The track which Cross Rhythms Radio have been playing is the slow and thought provoking "La La Love". Clearly a quizzing of this precocious new talent is overdue. We began by asking the emcee what inspired "La La Love". He responded, "'La La Love' is about letting the love inside of us shine and show everywhere we go. It's a fun encouragement song to get young people thinking about 'loving the world around them' with God's love. I wrote the song because I feel too many people in Christian and non-Christian circles are caught up with themselves and not focused enough on what really matters." The rapper's real name is Blake Young and he was born in Los Angeles, California. His early life was particularly painful. He said, "Divorce and sexual molestation were the foundations of my life at an early age. The voids and confusion inside of me left me searching for love and acceptance anywhere I could find it. I tried street life, partying, girlfriends, fashion, promiscuity and was still empty and still chasing to fill the void. Because of my emptiness I was running from God all through my teen years. Everything caught up with me in college, when I hit rock bottom. I was in such a dark place and so far away from God that I would go to sleep at night scared knowing that if I died I was going to go to Hell. I was depressed, lonely, my university asked me to withdraw and I was weeks away from being homeless. After talking with my mother on the phone about life, I finally made the decision to get to know God for myself. That began a five-year journey of restoration that led me to being passionately in love with God, and in love with sharing his love through music." Young Chozen had a friend who died of stomach cancer when she was just 15. The youthful rapper wrote a song for her and gave it to her mother. She loved the song so much she asked him, along with the youth choir, to perform it at the funeral. This was Young Chozen's first public performance. The rapper began to record and released six compilations/mixtapes. Eventually he was ready to begin work on a more ambitious project and started cutting tracks for what was to become 'Class President'. It wasn't easy for the young emcee. He admitted, "During the recording of 'Class President' so much was going on in my life. In the three years of making that project, I graduated from Bible College, married my wife, began travelling and pursuing full time ministry, and found out we were expecting our first baby girl. All of those experiences I tried to translate into each studio session." As well as "La La Love", another outstanding track on 'Class President' is "31 Status". The title refers to a movement for girls that the rapper runs with his wife which organises programmes and curricula to help girls realise their true identity in Christ. Said the emcee about the "31 Status" song, "It is an anthem for all women everywhere to declare that true beauty is not in how you look or what you are wearing. It challenges girls to rise to God's standard of beauty and virtue and guys to value those standards in a girl." Since 'Class President' was released in March 2012 Young Chozen has released a mixtape, 'Nightlight' (available on www.youngchozen.com), and has toured extensively. He said, "God has been very good and many doors have opened. My dream is to be able to minister in every continent in the next five years." When asked what spiritual lesson he has learned in recent times, he responded, "To trust God and not try to manufacture what we think is his will. . . There is a very fine line between a good idea and a 'God' idea. Just because something seems like a good idea at the time, that does not mean it is God's will for our life. There is a time for being proactive, but more importantly we should focus on being in tune to what God wants to do."